My name is Roger Hogue. I am a vein specialist and Diplomate of the American Board of Venous & Lymphatic Medicine (ABVLM). 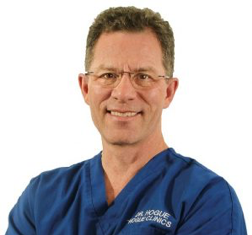 As the founder and owner of Hogue Vein Institute with numerous vein specialty clinics in Minnesota (USA), I believe physician-compounded foam (PCF) is being unfairly compared and criticized by a commercial industry promoting its own agenda. For example, research funded by BTG International Ltd, was published as an original article in Phlebology 2016, Vol. 31(4) 283-295 by Dario Carugo et al entitled, “Benefits of polidocanol endovenous microfoam (Varithena®) compared with physician-compounded foams” concludes that foam structure and stability of various sclerosing formulations show that Varithena® results in better overall performance compared with PCFs. I am writing this article and presenting compelling comparative data to advocate for PCF and to push back on commercial bias. There have been many opinions expressed by vein practitioners over the years purporting the optimal recipe and method for making physician-compounded foam (PCF). Without a standardized approach for identifying and evaluating the determinants affecting foam structure and stability and for selecting an ingredient composition to develop the ideal foam, hand-made-foam will be marginalized without any hope of evolving into the ideal sclerosant foam or for realizing its full potential. Many vein practitioners in the USA are sticking with hand-made foam rather than switching over to ready-made proprietary “foam in a can” (Varithena®) that uses a recipe of 1-part liquid to 6-parts gas (1+6 LGF = 1:7 LGR) to create a 1% polidocanol foam with a gas composition of 65% oxygen/35% carbon dioxide having ultra-low nitrogen content. Many of the published articles touting the benefits of Varithena® compared with PCFs have been company sponsored. To ensure a full and fair comparison, I set out to examine the determinants affecting foam structure and stability for proprietary “foam in a can” and PCF, specifically the influence of silicone-lubricated syringes on foam half time (FHT), foam coarsening time, and visual foam quality. I made various PCF formulations using 1% Asclera® (polidocanol) mixed with either 1-part liquid to 4-parts gas (1+4 LGF = 1:5 LGR) or 1-part liquid to 6-parts gas (1+6 LGF = 1:7 LGR) to create sclerosant foam using the Tessari method with two 10mL syringes, either silicone-lubricated or silicone-free. Stopcocks used with the Tessari method during the testing included B.BRAUN 4-way stopcocks for foam passage between silicone lubricated syringes, and IPA cleansed (silicone-reduced) BAXTER Large Bore stopcocks for foam passage between silicone-free syringes. Assessed gas compositions included room air, 100% oxygen, 100% carbon dioxide, and various custom medical gas mixtures of oxygen and carbon dioxide. To allow these gas compositions to be precisely made, the PRISM PORTABLE MEDICAL GAS CONTAINER CLOSURE SYSTEMTM was used, which was developed at Hogue Surgical LLC, an FDA-registered medical device company. The system consists of two D cylinder tanks on a rolling cart containing medical grade oxygen and carbon dioxide with custom gas regulators set at 2 PSIG for delivering filtered medical gas via silicone tubing and luer connectors. When attached to the PRISM PORTABLE MEDICAL MIXING & DELIVERY SYSTEMTM device, custom gas mixtures with ultra-low nitrogen content were created, mixed, and confirmed using a 902D Oxygen and Carbon Dioxide Analyzer by Quantek Instruments, then delivered into a Tessari method setup to create PCF formulations with various gas compositions. PCF formulations were handmade then assessed for foam half time (FHT), visual foam coarsening time, and visual foam quality using serial photography q15 seconds x 180 seconds. Data from the study including FHT and silicon atom content in ppm for each PCF formulation assessed will be submitted in manuscript form for upcoming peer-review publication in a scientific journal. 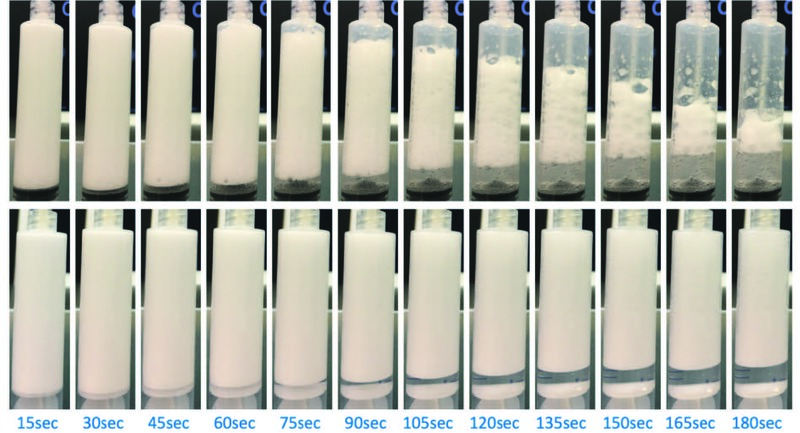 Visual comparison of foam structure and foam quality for various PCF formulations hand-made with different gas compositions using silicone-lubricated (top row) versus silicone-free syringes (bottom row) with 1% Asclera® (polidocanol) and 1+4 LGF (1:5 LGR) using the Tessari method with 20 pump cycles. Serial photography was performed every 15 seconds x 180 seconds for each PCF formulation with the initial image obtained 15 seconds after the final pump cycle was performed. Visual comparison of foam structure and foam quality for various PCF formulations with different gas compositions versus proprietary “foam in a can” (Varithena®) using silicone-lubricated syringes (top row) versus silicone-free syringes (bottom row) with 1% Asclera® (polidocanol) and 1+6 LGF (1:7 LGR). PCF formulations were hand-made using the Tessari method with 20 pump cycles, whereas proprietary “foam in a can” was ready-made. Serial photography was performed every 15 seconds x 180 seconds for each PCF formulation after the final pump cycle was performed for PCF. Serial photography was performed every 15 seconds x 180 seconds for proprietary “foam in a can” after 10mL of foam was filled and transferred from a silicone-free luer-slip filling syringe into a 10mL silicone-lubricated versus 10mL silicone-free luer-lock syringe.